Kaplan. 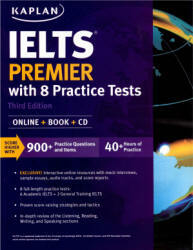 IELTS Premier with 8 Practice Tests. Kaplan Test Prep: 2016, 3rd ed., 505p. Congratulations on your decision to improve your English proficiency, and thank you for choosing Kaplan for your IELTS preparation. You've made the right choice in acquiring this hook—you're now aimed with a comprehensive JELTS program that is the result of decades of researching the IELTS and similar tests and teaching many thousands of students the skills they need to succeed. You have everything you need to score higher—let's start by walking through what you need to know to take advantage of this book and the Online Study Plan.